In Gideon v. Wainwright, the U.S. Supreme Court determined it to be an “obvious truth” that “any person haled into court, who is too poor to hire a lawyer, cannot be assured a fair trial unless counsel is provided for him.” Gideon thus made the provision of Sixth Amendment right to counsel services a state obligation through the Fourteenth Amendment. 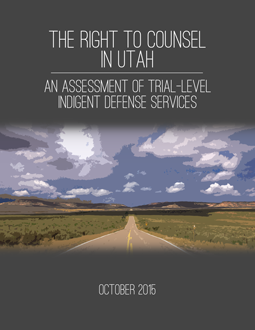 A Sixth Amendment Center (6AC) report, The Right to Counsel in Utah, released on October 26, 2015, details that Utah is one of just two states requiring local governments to fund and administer all indigent defense services (Pennsylvania is the other). Although it is not believed to be unconstitutional for a state to delegate its constitutional responsibilities to its counties and cities, in doing so the state must guarantee that local governments are not only capable of providing adequate representation, but that they are in fact doing so. The state of Utah, however, has no institutional statewide presence and only a limited statewide capacity to ensure that its constitutional obligations under the Sixth and Fourteenth Amendments are being met at the local level. Misdemeanors matter. For most people, our nation’s misdemeanor courts are the place of initial contact with our criminal justice systems. Much of a citizenry’s confidence in the courts as a whole – their faith in the state’s ability to dispense justice fairly and effectively – is framed through these initial encounters. Although a misdemeanor conviction carries less incarceration time than a felony, the collateral consequences can be just as great. Going to jail for even a few days may result in a person’s loss of professional licenses, exclusion from public housing, inability to secure student loans, or even deportation. A misdemeanor conviction and jail term may contribute to the break-up of the family, the loss of a job, or other consequences that may increase the need for both government-sponsored social services and future court hearings at taxpayers’ expense. Right to counsel issues in Utah’s felony courts are different in kind than those of the misdemeanor courts. There, most indigent defendants are indeed provided with a lawyer. However, depending on the local jurisdiction, that lawyer may work under financial conflicts of interest, or may be beholden to a prosecutor to secure future work, or may be appointed too late in the process or be juggling too many cases to be effective. The U.S. Supreme Court calls this a “constructive” denial of counsel. These conclusions were reached after an 18-month study of public defense services in ten sample counties, encompassing 90 percent of the state’s population and representing all eight felony-level trial court districts. The Utah Judicial Council Study Committee on the Representation of Indigent Criminal Defendants authorized the report, funded through the U.S. Department of Justice, Bureau of Justice Assistance. The Sixth Amendment Center, in association with the Defender Initiative of the Seattle University School of Law, conducted the evaluation. Perhaps Utah’s actual and constructive denial of counsel is best told through a single courtroom observation. Prior to the judge taking the bench in a rural justice court, a law enforcement officer walked into the courtroom and stated: “There are a lot of things you need to understand in this video. So pay attention.” The officer then played a video about the defendants’ rights and court procedures, while people walked in and out of the courtroom. At the conclusion of the video, the officer asked if anyone had any questions. “I have a question,” one woman said, but the officer did not hear her and left the courtroom to call for the judge to begin the calendar. No public defense attorney or prosecutor appeared in court that day. The first defendant called forward was appearing for his arraignment on three separate charges – two class B misdemeanors and one class C misdemeanor. As with all misdemeanors in Utah, these charges carry a potential jail term. Asked by the judge how he wanted to plea, the defendant stated that he wanted an attorney. The judge then instructed him to fill out an indigency determination form and moved on to the next case. The second defendant, facing a class B misdemeanor charge, also asked for a public defender, and he too was directed to fill out the form. By this time, the first defendant had finished filling out his application form, and so the judge called him back to the podium to be appointed a defender. “You will be given a piece of paper with the public defender’s contact information,” the judge explained. The second defendant likewise finished his paperwork and appeared before the judge to be appointed counsel. “I know you were filling out your paperwork,” said the judge, “but you heard what I just said to [the first defendant], right? “What did you have in mind?” the judge asked. “I do see . . .” the judge began. But the defendant interrupted, continuing with his explanation. “Judge, I am trying to get on the right track,” the defendant said. “I got out of prison last year, but I have a serious medical issue and I can’t see a doctor. “Your fine is likely to be $340,” the judge explained. “Perhaps we can give you credit if you get a psychiatric evaluation at [a local community health agency]. The U.S. Supreme Court has determined critical stages requiring counsel to include, among others, the arraignment and sentencing hearings. This third defendant, being indigent, was entitled to counsel during the arraignment and sentencing because jail was a possibility (indeed, a likelihood, given the stated intentions of the judge). Under U.S. Supreme Court case law, a defendant may choose to waive his Sixth Amendment right to counsel. However, in doing so, the court must determine that the defendant made that choice knowingly, voluntarily, and intelligently. Though informative, showing a group video at the start of court, particularly without knowing whether each defendant was able to and actually did see and hear that video, does not replace the need for an individualized determination by the judge that each defendant wanting to waive counsel is doing so intelligently. In sentencing the third defendant, the court clearly recognized the danger that the defendant might suffer from a mental impairment that would affect his judgment and understanding. Yet the court arraigned and sentenced this defendant without providing him an attorney and without making an individualized determination that this defendant understood the rights he was waiving. This is an actual denial of counsel. The likelihood that the first and second defendants will receive a constructive denial of counsel is high. For example, the municipality relies on the city prosecutor to select defense counsel, to enter into contracts with defense counsel, to set the compensation rate, and to decide whether to renew defense contracts each year. It is a conflict of interest to have one courtroom adversary financially controlling the other. This is because the defense attorney must take into account what he needs to do to please the prosecutor to secure future contracts, rather than advocating solely in the interests of the indigent accused. For the court in question, the indigent defense contract pays the misdemeanor attorney a flat $600 per month to handle the representation of everyone determined to be indigent. The contracted private attorney for this courtroom estimated that he handles approximately 20 cases per month. This means he is compensated at approximately $30 per case, which produces financial incentives for the attorney to dispose of the case as soon as possible. And indeed, the defender meets with the city prosecutor to begin plea negotiations before talking with the defendant, as the judge told the defendants would happen. Because there is no independent supervision of this attorney, the misdemeanor lawyer in question is allowed to seek contracts from other jurisdictions too. In addition to his contracted justice court work described above, the attorney in question handles representation in the county district court and conflict representation in the county juvenile court. In total, this attorney handled 423 cases on behalf of indigent defendants in 2013, including 101 felonies. Including all contracts, the attorney is paid $37,200 annually (this attorney handles no private cases). That means, on average, he is compensated just $87.94 for each and every case, regardless of the complexity of his felony and delinquency cases. To put it another way, if the attorney in question works 40 hours every single week of the year (or 2,080 hours annually), the attorney is paid $17.88 per hour. Though $18 per hour may sound like a lot of money to the average person trying to scrape by in hard economic times in rural Utah, it is not a lot of money given the parameters of what is required of a practicing attorney. The maintenance costs to operate a law practice in Utah – commonly referred to as “overhead expenses” – are many. Overhead costs must be paid each month in order to stay open for business, and so the lawyer’s take home pay is whatever amount remains after providing for office rent, telecommunications, utilities, accounting, bar dues, business travel, and professional liability insurance. As a means of comparison, the Mississippi Supreme Court determined, in a case challenging that state’s assigned counsel compensation rate, that indigent defense attorneys are entitled to a reasonable hourly fee in addition to overhead expenses. Although that case is now nearly 25 years old, the Mississippi Court heard testimony from the Mississippi State Bar Association that the average overhead rate in that state was $34.86 per hour at that time (or nearly twice the 2014 hourly rate paid to this attorney in rural Utah without taking into account overhead costs). Despite the fact that actual and constructive denials of counsel occur in Utah courts, it is wrong to conclude that Utah’s criminal justice system and its stakeholders hold ill intent toward the indigent accused. Indeed, the very opposite appears true. In every jurisdiction visited, conscientious people were striving to do well by both victims of crime and the accused. It is simply the case that even the most well-meaning local stakeholders will, at times, fail to meet the dictates of right to counsel law without appropriate guidance and supervision. This report is about the failure of the state of Utah and not a condemnation of the local people working to fill the gap left by the state. There is some good news. Even as right to counsel deficiencies were discovered and preliminarily reported, the Study Committee began working to rectify those issues that could be addressed immediately, such as providing training on the right to counsel for justice court judges. When presented with an early draft of the report, the Study Committee confronted the report earnestly, challenged it where they disagreed, and ultimately resolved to work over the summer of 2015 to devise Utah-specific answers to the problems identified in the report. Indeed, we expect reform recommendations to be announced shortly.